MINISIS is a tool that can be used to build any database application or repository. The SMA software toolkit was designed to avoid the need for programmers and coding experts. Our philosophy is that clients know their business and processes, and need to be able to use the tools themselves. Users need tools that are a logical extension from their knowledge and usage of other desktop products. For our clients, investing in the SMA means significant savings and budget gains in time, resources, and other costs guaranteed. Implementing MINISIS typically takes only 25% of the budget it would take to set up and run a similar SQL™ or Oracle™ database. In addition to being one of the most cost effective solutions, the MINISIS SMA is also one of the safest database engines available. MINISIS is cleared to Protected B Status from IT and physical perspectives. Furthermore, our software has been in use for over 40 years without any security breaches. In an age where hacking is just as much of a threat as virus transmission, MINISIS clients can rest assured that their data is safe and secured. MINISIS has several applications built for security, anti-terrorism, and tracking systems, and it has consistently passed independent security reviews. This diagram represents the standard architectural types available. 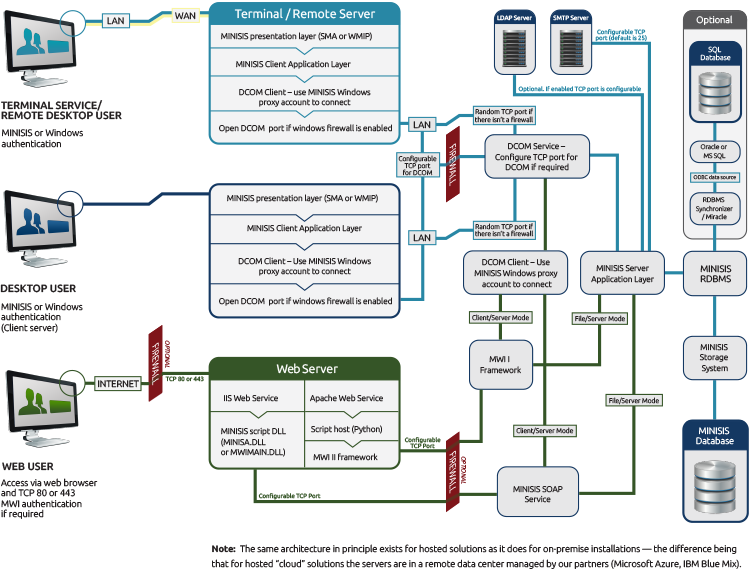 In addition to client server/fat client architecture (for networked organizations), MINISIS offers web/ thin client architecture (for Internet based solutions), as well as remote terminal service configuration (for hosted/Internet based solutions).